GMA’s search for a hit late-morning series continues. After failing to hit paydirt with ‘Ang Forever Ko’y Ikaw’, GMA will once again try to give the popular JoChard (Jodi Sta. Maria and Richard Yap) love team a run for their money. Their latest attempt will come in the form of two young stars that will topbill the newest series ‘My Guitar Princess’, which premieres this Monday. ‘My Guitar Princess’ will be led by a pair of emerging Kapuso stars Julie Anne San Jose and Gil Cuerva. In this series, Celina (Julie Anne) is a promising but insecure 18-year-old singer and guitarist whose mother Adele (Sheryl Cruz) does not approve of her singing in front of an audience. Amid her mother’s objection, Celina insists on performing even if it means tearing their relationship apart. Soon after, Celina’s talents caught the eye of two men who seek to fall in love with her: Elton (Gil), a 20-year-old singer based abroad whom fans call the ‘prince charming of pop’, and Justin (Kiko Estrada), Celina’s long-time confidant. Completing the cast of ‘My Guitar Princess’ are Isabelle de Leon, Jazz Ocampo, Marika Sasaki, Marc Abaya, Ralf King, Kier Legaspi, Frank Garcia, Maey Bautista, Rob Sy and Lui Manansala. It will be directed by Nick Olanka. The popular love team of Jodi Sta. Maria and Richard Yap (plus Robin Padilla as the third wheel) in ‘Sana Dalawa ang Puso’ will provide a very tough obstacle for Julie Anne San Jose and Gil Cuerva. After all, these are a pair of young Kapuso stars who have been long underappreciated by the masses despite their immense talent. That said, the only hope for GMA is to can maximize the potential of Julie Anne and Gil. Of course, it also helps that an aggressive social media and promotional campaign will benefit the show and its lead stars considering the network’s weaknesses in the two departments. Still, it will not be easy for ‘My Guitar Princess’ to overcome ‘Sana Dalawa ang Puso’. If GMA wants to avoid a repeat of ‘Ang Forever Ko’y Ikaw’, they need to push the right buttons, otherwise another short series is in the offing. ‘My Guitar Princess’ airs weekdays before ‘Eat Bulaga’ on GMA. On Sunday, June 19, his newest sitcom ‘Hay, Bahay!’ will officially premiere on GMA. This will mark Vic Sotto’s eighth sitcom as a solo artist, and ninth overall. While he was better known as 1/3 of the fabled trio TVJ alongside Tito Sotto and Joey de Leon, and the host of ‘Eat Bulaga’, it was his individual comedic brilliance on television and film that cemented his legacy. Without further ado, let’s look back at his solo sitcoms over the years (in chronological order), starting with the first four on the list. The sitcom that started it all, ‘Okay Ka, Fairy Ko’ introduced viewers to Enteng Kabisote, the mechanic-turned-husband of the fairy Faye. The character then went on to star in nine box-office hit movies based on the sitcom. Believe it or not, ‘Hay, Bahay’ is not the first sitcom to star both Vic Sotto and Ai-ai delas Alas. When Charlene Gonzales left ‘1 For 3’ to host ABS-CBN’s ‘Keep on Dancing’, Ai-ai was introduced in the sitcom as one of Gene’s (Vic) housemates. The first sitcom to feature Vic and daughter Danica, ‘Daddy Di Do Du’ was the second in Vic’s sitcom filmography to feature a mystical theme. Unfortunately, just a few months into the sitcom’s run, Nida Blanca was murdered, and her character was written off afterwards. Based on the Koreanovela ‘Full House’, ‘Ful Haus’ marked the debut of child star BJ Forbes, whose claim to fame was via the Tide detergent commercials as ‘Tolits’. This was also the first project for Mitoy Yonting prior to winning season 1 of ‘The Voice of the Philippines’ several years later. For Part 2 of A History of Vic Sotto sitcoms, click here. It’s been a rough 2016 for GMA’s Afternoon Prime. Since the start of the year, ratings for the said block have gradually plummeted, while ABS-CBN’s Kapamilya Gold enjoyed a renaissance of sorts. The ratings were so bad that by early April, GMA decided to cease producing any further episode teasers in an effort to save money. But rather than admit defeat, they continued to produce new dramas, and today, they will have a new teleserye coming up. The upcoming series, ‘Magkaibang Mundo’, will mark the on-screen return of Louise delos Reyes for the first time since ‘Kambal Sirena’, and she will be paired with Juancho Triviño for this unusual drama. In ‘Magkaibang Mundo’, Louise is Princess, the heiress of a couple (played by Assunta de Rossi and Gabby Eigenmann) who owns a shoe business. She was orphaned when her father died and her mother was forcibly separated from her, and from then on, she was harshly treated by her aunt and step-cousins. Initially, she found comfort in Jeffrey (Dion Ignacio), but Princess soon realized that she already harbored her true feeling to a dwarf named Elfino (Juancho). Both were close since they were children, and while growing up, Princess again turned to Elfino for solace and hope, which eventually led to a relationship between the two. Joining them in ‘Magkaibang Mundo’ are Rez Cortez, Gina Alajar, Maricar de Mesa, Isabelle de Leon, Mike ‘Pekto’ Nacua, Liezl Lopez, and Marika Sasaki. The viewers will also be introduced to YouTube sensation Balang, who will play one of Elfino’s friends. While ‘Magkaibang Mundo’ has been promoted heavily leading up to its premiere, there are still two big obstacles facing the series. One is its ability to keep up with the final 30 minutes of ‘It’s Showtime’ and the first 10 of ‘Doble Kara’, and two, GMA’s recent decision to stop airing episode teasers of their dramas. These two challenges will not be easy for ‘Magkaibang Mundo’. Still, if they can overcome these dwarfing obstacles, then it should help spike the series’ ratings in the long run. Hopefully GMA can commit to this series for a long time. After all, with so much frustration over the poor ratings of their dramas, all they need now is some victories to right the ship, along with some badly-needed promotion. Directed by Mark Sicat de la Cruz, ‘Magkaibang Mundo’ airs weekdays after ‘Eat Bulaga’ on GMA’s Afternoon Prime. It’s a thumbs-up for TV5’s ‘Trenderas’. A story about three trinket vendors aspiring to become singing superstars, ‘Trenderas’ will have its pilot episode aired tomorrow night. The one-hour special will focus on the three vendors’ humble beginnings as they embark on a quest towards fame and stardom. It can be recalled that teasers for ‘Trenderas’ began to air as early as July. But for some unexplained reason, TV5 pulled out the teasers due to the lack of any programming space at the time, thus shelving the project for the time being. Then ‘It Takes Gutz to Be a Gutierrez’ ended its first season in August, and new teasers for ‘Trenderas’ began to air on the Kapatid network. This time, TV5 made sure that ‘Trenderas’ will finally have the go-signal it deserves. The upcoming musical comedy drama series will star Isabelle de Leon (as Isabelle), Katrina Velarde (as Diva), and Lara Maigue (as Lara). Joining the trio in their rags-to-riches journey are Dingdong Avanzado (as Julio), Ara Mina (as Diane), Tina Paner (as Veronica), Carl Guevarra (as EJ), and Edward Mendez (as Benjo). ‘Trenderas’ will not be complete without the three villains who will try to thwart the dreams of Isabelle, Diva and Lara. The ‘Tres Malditas’, as they are called, will star K Brosas (as Katy), Cacai Bautista (as Miley), and Kitkat (as Lady). 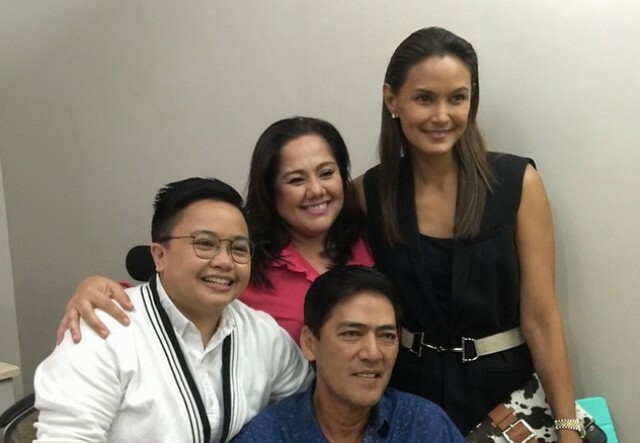 Completing the cast are veteran talents Francine Prieto (as Viveka) and Rez Cortez (as Mother Pearl). Also joining the series is a special guest star that needs no introduction. The one and only ‘Superstar’ Nora Aunor (as Celestina Cruz) will play the role of a famous singer-turned-mentor and guiding light to Isabelle, Diva and Lara. Overall, ‘Trenderas’ is a series that is worth watching. With a mix of song and dance numbers, confrontations between the ‘Tres Malditas’ and the ‘Trenderas’ girls, and some comedic, romantic and dramatic scenes in between, ‘Trenderas’ will definitely capture the sensibilities of both music lovers and viewers alike. ‘Trenderas’ premieres tomorrow night after ‘Tropa Mo Ko Nice Di Ba’ on TV5.